With June 1st came winter in New Zealand. Apparently the June 20th winter/summer solstice date doesn’t have much clout here. If winter remains a high of 15C (60F) everyday, sounds like a good season to me (this coming from someone born & raised in Massachusetts, I don’t think my California coworkers will agree with me on this one). Realistically, there is actually snow in the forecast for tomorrow. Our native New Zealand intern asked me before he left today if we would still work when it snowed. When I said “most likely yes” he gave me a great look of horror. For the record Christchurch shuts down when it snows, but apparently you can always go to KFC for some tasty chicken. The week was another busy one, but it’s just starting to become a typical occurrence. Typically 4pm comes around (the time my multiple cups of espresso coffee intake has worn down), I’ll switch up my iPhone to play some more upbeat guilty-pleasure music and can run on that for as long as I need to. 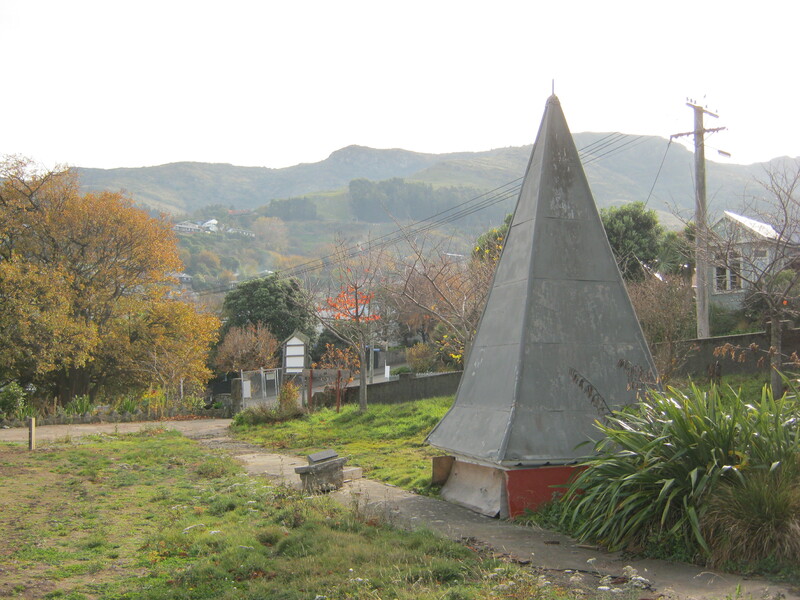 I visited a couple more churches (unreinforced stone work doesn’t always fare so well in earthquakes) and got entangled in another fun conversation with the same priest from before. Although, after we proved we didn’t bite, were nice people, and were actually trying to move along the insurance process he became downright friendly. Slowly but surely I am making friends with the locals. The local coffee shop barista even called me over the other day and said “Jennifer right?” as he handed me my latte with a smile. You’ve got to love the days when you finally become a regular. 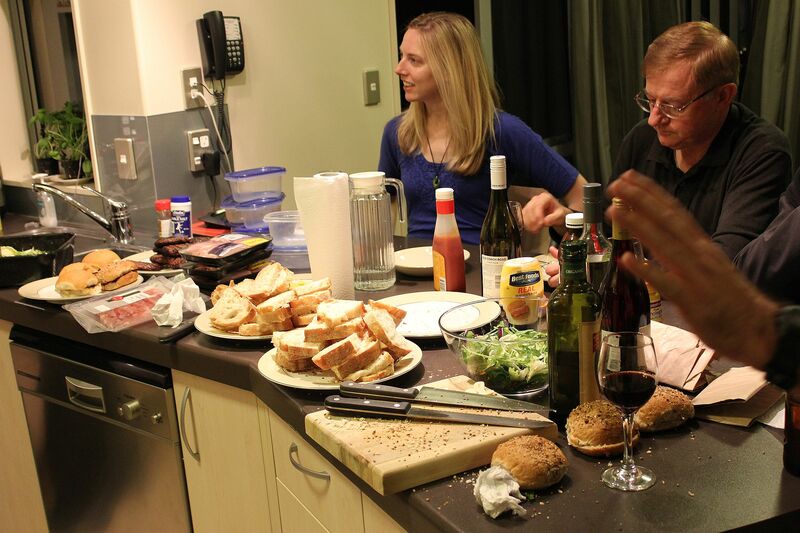 This 3-day weekend kicked off Friday with yet another apartment dinner party & movie night. Another amazing meal was cooked for all. A good Christchurch office requirement should probably be that at least 2 great cooks that double as engineers be present at all times. As I shared in the last post, Star Wars was our movie night last week, this week we decided to watch Caddyshack (one of these days I’ll convince everyone to watch a movie made after the 1990s, working on it…). 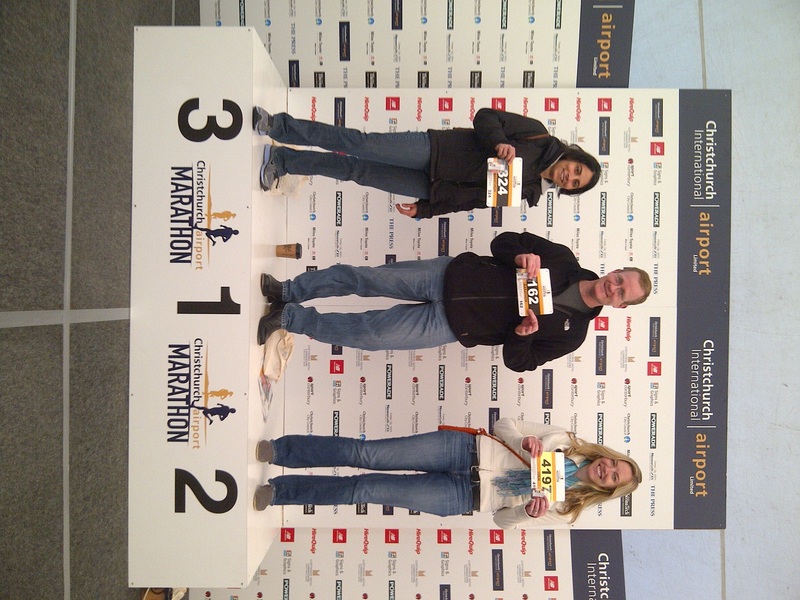 With our favorite marathon runners – Viviana & Nick – gearing up for the Christchurch marathon on Sunday a few of us planned some surprises. 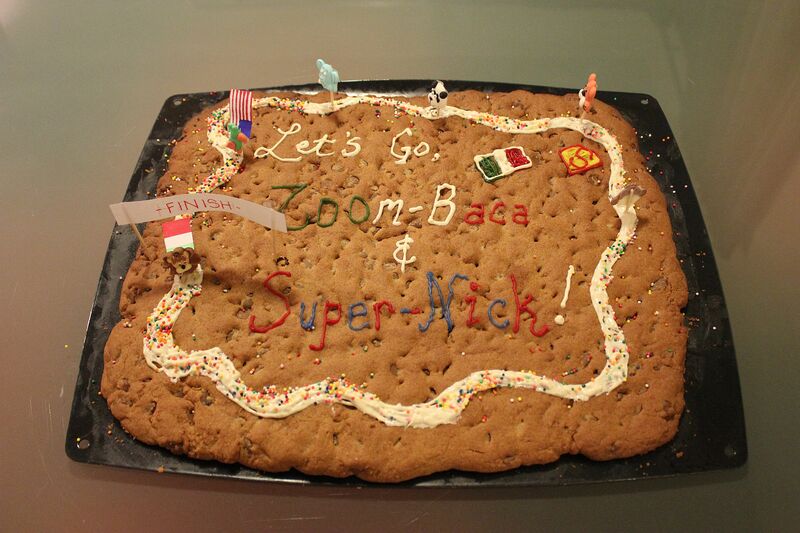 During lunch on Friday I escaped work with another coworker and made a giant cookie cake that we turned into a race course. Additionally, we made mildly ridiculous custom cape flags for both marathon runners to wear once they crossed the finish line. 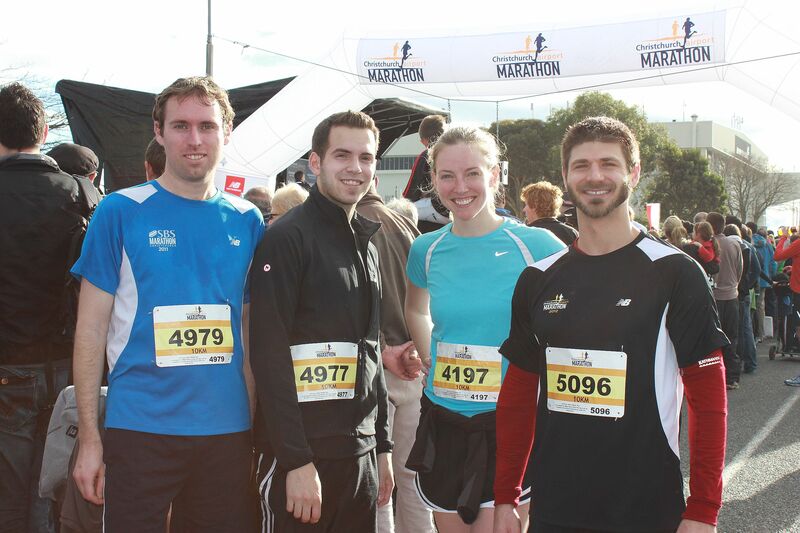 Four less ambitious coworkers, myself included, entered ourselves into the 10k–the shortest race available for the Christchurch Marathon event. The six racers spent most of the rest of the weekend watching movies, eating a lot, working a bit, and running together. 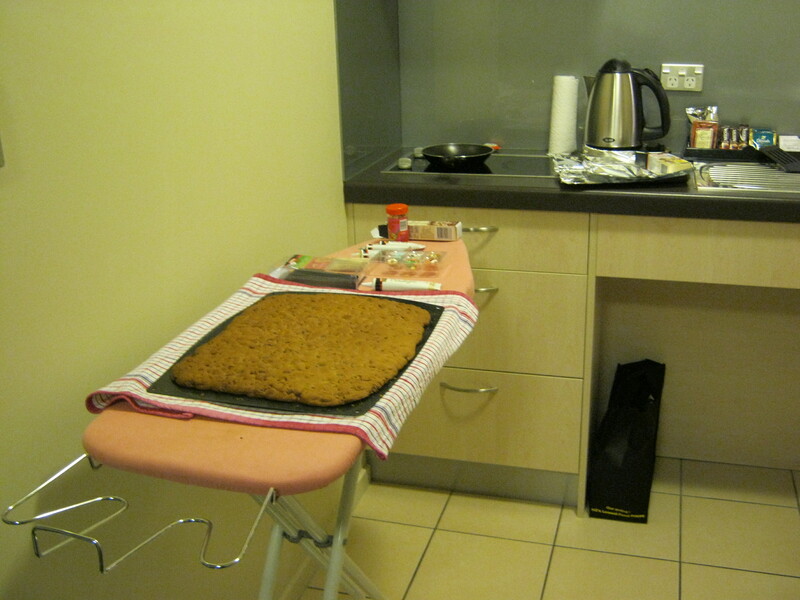 Solving Problems = pulling out the ironing board when you don’t have enough counter space to decorate. The infamous cookie cake. I finally got to bake in New Zealand. Each runner got to claim their own “runner” animal. Typical dinner party spread. Note the numerous amounts of bread. Any ideas for our next movie night? I’ve given up hope that a chick flick will ever be a top choice. Maybe I can swing Moulin Rouge or Princess Bride one of these days. Happy Memorial Day weekend to everyone back in the States. I am not enjoying a 3-day weekend currently; however, next weekend I will be thoroughly enjoying my Monday off for the good Queen’s birthday. Once Friday morning rolled around I was quoted as saying “Why haven’t we had a big earthquake yet?”; therefore, was obviously blamed when a 5.2 magnitude hit after lunch. 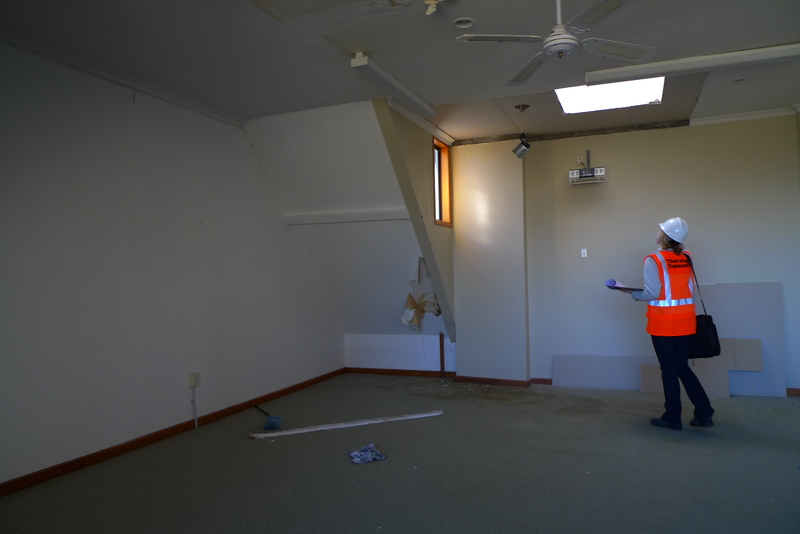 Luckily this was a bit fun for those of us in our concrete bunker office; however, not so fun for those off inspecting some very damaged buildings! No worries, everyone is a-okay, just a few of us were a bit shaken up, pun intended. Friday evening we decided to have another apartment party — where all of us coworkers get together in one of the larger hotel rooms, cook a great dinner, and have a lot of laughs. This time around we decided to initiate “movie night.” One of our coworkers announced he had never seen Star Wars previously. If you know anything about the stereotypical engineer this might as well be the 8th deadly sin. We immediately confiscated the projector from the office, borrowed Star Wars from our Kiwi intern who conveniently had a copy, and set up a very comfortable movie setting for after dinner. Not going to lie, watching Star Wars with a crowd of engineers aged 24 to 50-something is quite the hilarious experience. I wish I captured a photo — one coworker even showed up donned in multiple sheets, some flip flops, and a flash light (aka light saber) to channel Obi-Wan Kenobi. Saturday was time for a wine tour. Myself, two other coworkers, and a friend working with another firm hopped in the car and headed out in search of vineyards. If you’ve been on the previous wine tours I’ve been on, you typically show up at a vineyard (you can tell by the vines), see a very pretty building, are ushered into the vineyard cafe to a fancy bar, and given a tasting by an employee of the vineyard. This was a bit different! The first place we encountered was called CharEes. We drove up to a small house with a trailer outside and were a bit clueless about what to do. All of a sudden a woman runs out of the house yelling “come in, come in.” No joke, she literally brought us into their family house, sat us at the kitchen table and started bringing out wines. Her daughters were brewing tea, and another child was watching cartoons in the adjacent living room. All the while the dog kept barking at us. We must have sat there for a while. We learned so much about Esma (the woman) and her husband Charles and how they’re now living their dream after purchasing the vineyard in 2007. Charles even stopped in the kitchen and chatted it up with us about his wine making techniques. They have big plans in the future to turn the shed into a restaurant. I loved this family! After a few failed attempts (vineyards were closed or didn’t have tastings available) we found ourselves at Melton Estate – your typical restaurant/winery. 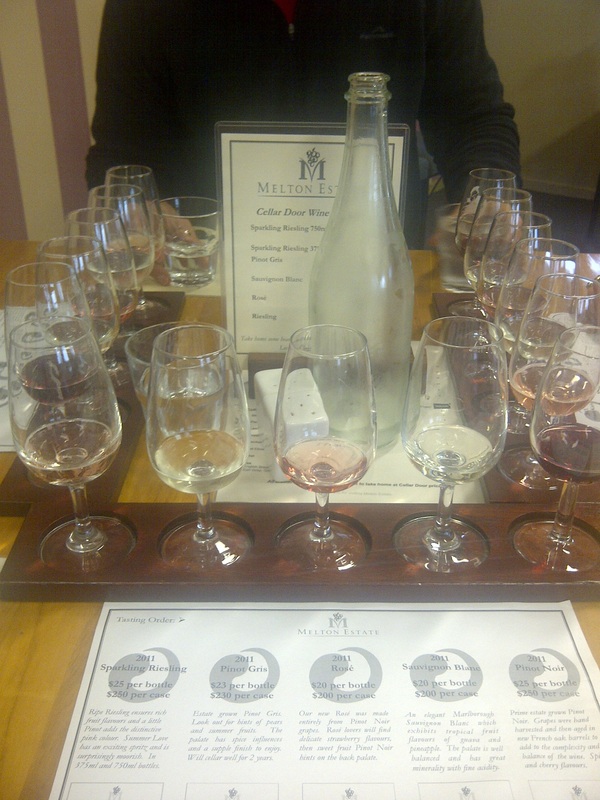 Upon asking for a tasting we were brought out individual wine planks! The owner(?) here was also fabulous. She was full of energy and even started giving one of my coworkers a back massage half way through the tasting! She helped us with directions to several other nearby wineries which was very much appreciated. We then headed to Tresillian. This had a beautiful home on the property; however scaffolding was everywhere and, sure enough, we saw several cracks throughout the walls. Upon parking we met up with the owner, Graeme, who was currently in the process of laying down hardwood floors in the back building. We then learned the ENTIRE story of how the house was damaged, but the insurance company paid them off and they’re lucky to have an additional space (the back building) to temporarily live in. We were then brought to a tiny shed–literally the 4 of us with the owner squeezed in. Are you getting the trend of not-your-average-vineyard tour? Graeme told us we were the first visitors he’s had in three weeks. 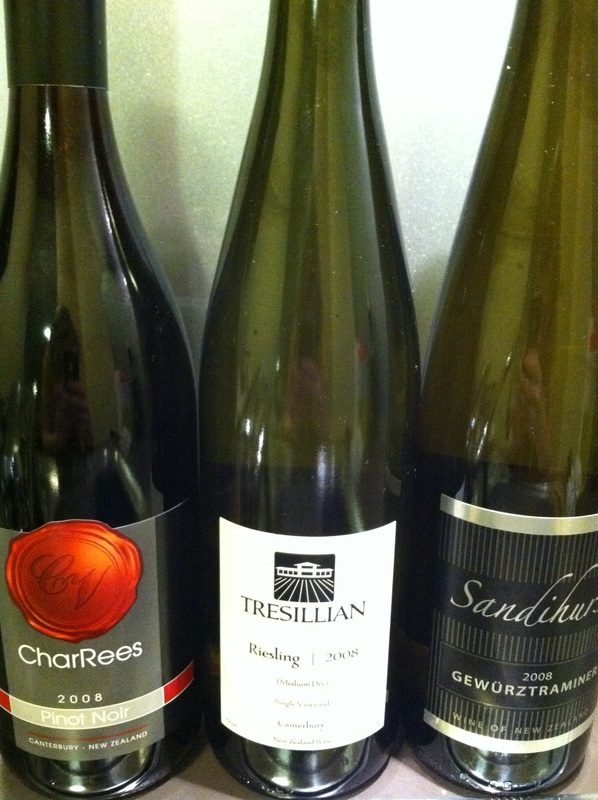 Lucky for us since we were able to purchase the most fabulous Riesling I’ve ever tasted (more visitors might have bought it all ahead of time!). We had 2 more stops. The first was Langdale, which was just a venue but the next door neighbor made wine and she met us there to give us a tasting. The last was Sandihurst. This was the first vineyard that made their wine on-site. They mainly export to small restaurants in the United States. They ship to two different restaurants in DC and one is Chef Geoffs – a place I’ve been! I made sure to take their card so I can check them out again when I’m back home. Phew! Ok, I’m done with talking wine. Here’s a photo of my loot. The maid may start to think I’m an alcoholic if I keep adding to my collection like this. This upcoming Sunday I chose to race 10k (6.2miles) at the large, local Christchurch Marathon event (there was no way I was running the full marathon). I definitely don’t feel prepared, but I can get through it which is all I care about at this point. Therefore, Sunday morning I sneakered up, checked on-line to see a sunny weather forecast, only to open up my slider door to POURING rain. Being the runner that I attempt to be I headed out anyways. I needed to get my long run in! The sun was glaring which just made everything worse, I kept saying to myself “New Zealand – the only place I can get pneumonia from being soaked with cold water and a severe case of skin cancer from this extreme sun at the same time.” As soon as my bitterness took the better of me around mile 3, I turned into a park loop and found the most beautiful double rainbow stretching over the city. Needless to say my mood was lifted and by the time I arrived back at my hotel the weather turned into a beautiful 20Celcius day. 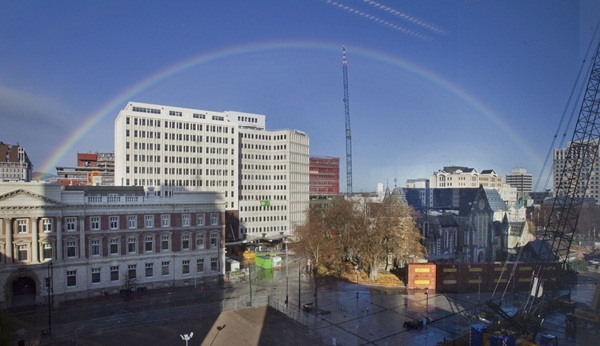 The Press (Christchurch Newspaper) captured a great photo below that was front page news Monday morning. Phew there you have it, work, earthquakes, Star Wars, wine, & rainbows. What a compilation! 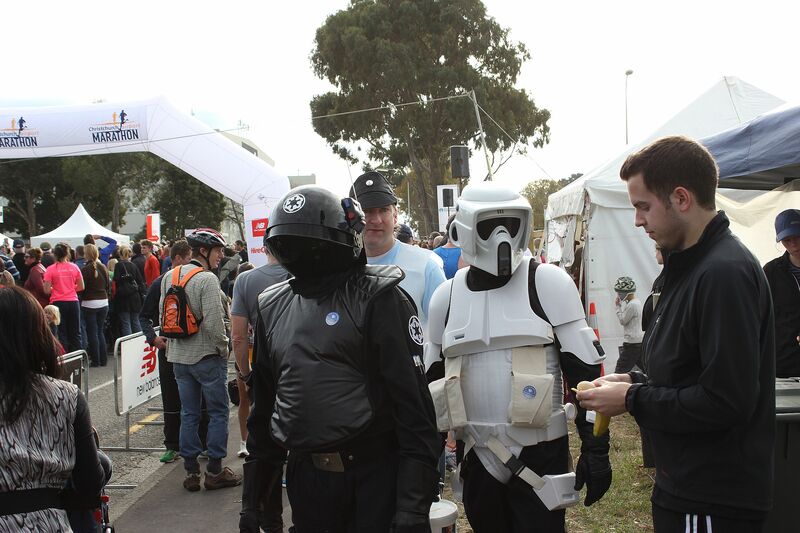 Next week will be all about the Christchurch Marathon & a few surprises thrown in there. Hopefully I can get up to Hamner Springs – the nearby spa town sometime soon to relax in a hot spring after this race is over!